In the early 1980s Tom Dixon played bass in the short-lived disco band Funkapolitan. In the intervening years he has graduated from the rhythm section of a support act to become the frontman of an internationally renowned design brand. Nevertheless, one can definitely see that disco influence in the metallic-finished pendants and melt lights which are, arguably, the brand’s most recognisable and distinctive products. Occasionally lugubrious and with an air of the practised shambolic, Tom Dixon’s manner belies a shrewd brain for business and virtuosic (essentially self-taught) design talent that have driven the development of a global brand. Across furniture, lighting, and homewares, the bold sculptural aesthetic of his work has won legions of admirers. You’ll see Tom Dixon pieces not only in the homes of the design-conscious classes, but also part of the interior schemes of trendy modern restaurants, boutique city hotels, and even – I’m told – Prague strip clubs. The latest venture for Tom Dixon – the individual and the brand are somewhat inseparable – is the relocation of his headquarters to The Coal Office, a 1,640 sq m space in London’s King’s Cross. The site will not only host the brand’s flagship retail presence but will also include office space, a restaurant, and a studio for both in-house product development and collaborations with other companies. There is also a dedicated area for trade customers and plans for a small production facility. Dixon has always been interested in the fabric of the city. Indeed his ‘London’ scented candle brought to the home fragrance market notes of red brick and salty Thames. It’s fitting therefore that the designer’s choice of new home should be a canal-side building, once a coal storage facility serving the railways emanating from the nearby King’s Cross station. The location is a slice of urban-industrial grittiness at the heart of one of the UK’s most extensive and ambitious regeneration projects. In more recent years the arches, which in the age of the railway had housed tonnes of coke, became home to the pilled-up ravers who partied until dawn in the night clubs clustered behind the station. What it says about contemporary London that a patch once synonymous with nightlife’s various subcultures is to be the HQ of an interior design brand is perhaps beyond the scope of these pages. Tempora mutantur, nos et mutamur in illis and all that. Speaking to journalists during a tour of The Coal Office ahead of its opening to the public in April, Tom Dixon CEO Jamie Mitchell stressed his hope that the redevelopment of the King’s Cross area would respect its urban character whilst helping it to forge a fresh life as a hub for creative, forward-looking businesses. With art school Central Saint Martins based on the other bank of the canal and Google’s European headquarters under construction nearby, The Coal Office is a further ‘anchor’ addition to the King’s Cross scheme that – it is hoped – will help to cement its vibrant new identity. Over a breakfast buffet of charcoal inspired dishes (think black bread, black cheese, and black meringues) in the site’s studio space, Dixon took the opportunity to introduce a number of new products and collections. 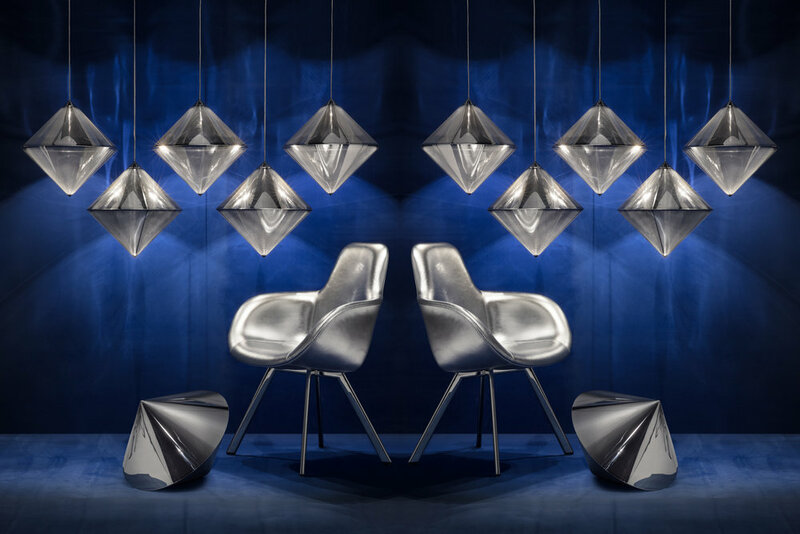 Conscious that the Tom Dixon name has become closely associated with shiny metallics – in particular copper and brass – the designer unveiled a fresh direction with three new colourways for 2018: glossy black, stainless steel, and electric blue. Meanwhile, through experimenting with a technique known as physical vapour deposition Dixon has found a method of coating his metallic lampshades with an extraordinarily vibrant and evocative blue finish. These – along with a re-issue of the stainless steel ‘Top’ pendant lights – will introduce a retro-futuristic space age feel to parts of the collection. In what Dixon described as a “blessed relief” the brand did not exhibit in Milan this year. However, Dixon himself did visit the festival in the capacity of an interested visitor ahead of a Tom Dixon ‘world tour’ that will encompass events in Casablanca, Reykjavik, Sydney, and, most likely, Nashville and Dhaka too. It is clear that Tom Dixon is now a global brand – but a brand that maintains a strong sense of its British identity. In Tom Dixon’s new home at The Coal Office, the brand has a physical link to the smoke, fuel, and steam of the city’s industrial past within a development project that promises to be a cultural and retail hub for future generations of Londoners and visitors.